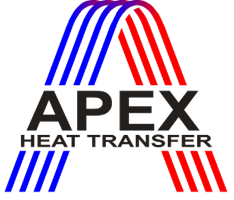 The proprietary design plate-type heat exchangers developed, fabricated and supplied by APEX Group are heavy-duty exchangers for handling large volumes of gases for heat recovery and gas handling applications. The elementary blocks used for multi-block modular constructions are fully shop-assembled as self-supporting blocks designed for ease of transport and field erection. The core is made up of smooth flat plates, which create alternating passages for the two fluids. The plates are sealed along the edges by welding according to proprietary design and manufacturing techniques to prevent any leakage of the higher-pressure fluids into the lower-pressure fluid inside the core. Spacers are located between the plates at regular intervals to ensure a uniform spacing between plates in operation. The spacers can be “spot” or “continuous”. The spot spacers are small and provide minimum flow obstruction. Spot spacers ensure a minimum fouling tendency and maximize the effectiveness of cleaning. The casing provides the housing of the core and gives the block its structural strength. The casing is provided with integral flanges for block-to-block assembly and connection of the ductwork. The core is sealed against fluid leakage by a proprietary sealing mechanism, which allows the thermal expansion of the core inside the casing at all operating conditions. Large heat exchanger units are designed for modular construction from elementary blocks. The modular construction allows designing the blocks for optimum size and optimum material selection while keeping to a minimum the fieldwork. Large units are assembled at site from elementary blocks. Extremely large units can be designed in parallel trains to simplify the structural support design in relation to the large weight and thermal expansion. Each unit is designed for optimum transport of the modules and for optimum erection at site. Each transport module is fully shop-assembled in the fabrication shop and provided with permanent and/or temporary lifting lugs for handling during transport and during erection. Depending on the size and destination of the unit, the shipping modules can be designed for transport by container or as loose items. The size and weight limitations of the containers allow the design of convenient modules for most applications and therefore most of the units are shipped containerised. As a standard the modules are shipped suitably packed for three months storage at site. Packing in wooden crates is normally not practices but can be provided at customer’s specific request. During operation at normal capacities the heat exchanger units require no regular inspections or operator’s attention. Periodic observation at large intervals is recommended to detect and correct any unusual behaviour. When no permanent fouling other than normal scaling is expected cleaning is usually not required. It is, however, recommended to water wash the unit at least once in 3 – 5 years. Permanent cleaning devices can be supplied for applications with a high fouling potential.